RadioIndy is pleased to present Boz with a GrIndie Award for the CD "Karma Knows..."
"Karma Knows..." Reviewed by RadioIndy.com! 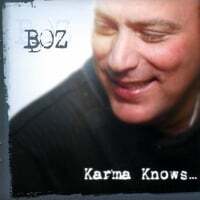 “Karma Knows...” is the adult contemporary solo debut from singer/songwriter Boz. Known throughout the music world as the frontman of progressive rock band Us, formerly known as The Chosen Few, Boz takes a different direction and delivers a positive, spiritual, and mature album. The arrangements and vocals are in the same vein as the career artists before him, including Peter Gabriel, Sting and Don Henley. The lyrics take on a variety of aspects of human life such as self-realization, lost love, and one's relationship with God. “Karma Knows...” is well-produced, sounds professional and is ready for radio play. “Reservation” has a unique arrangement with a great beat, nice vocals, and thoughtful lyrics. “Thank You (In So Many Ways)” is a piano-led song with soaring violins, a great vocal performance from Boz, and inspiring spiritual lyrics. Overall, “Karma Knows...” is an impressive solo debut from an experienced musician who has his sights set on taking his craft in an interesting new direction. Fans of Boz's career work and fans of modern adult contemporary are going to want to pick this one up.